November 3rd. 6 PM. After a few days in Bangalore, it was time for the bangaloREsidents to tell Bangaloreans what they hope to work on during their stay and what kinds of inputs they are seeking from locals. Spot on bangaloREsidents, an evening of presentations by the residents, was an opportunity for them to connect with Bangalore’s community of artists. The event was attended by members from the host organisations, as well as local practitioners from theatre, dance, film, urban design, and music. Hosted by one of Bangalore’s beloved comperes and poets, Joshua Muyiwa, the evening was light-hearted, despite one presentation after another. In his typical offhand manner, Joshua kept everyone entertained with (sometimes incorrect) facts about Germany’s connection to Bangalore and anecdotes of his own interaction with Germans in India. Of Lal Bagh’s chief landscaper, Gustav Krumbiegel, he said, “I thought he was just another Tamil uncle”. Each resident had seven minutes to speak about their past work and what they wanted to do in Bangalore. In the first row, an intern kept what was supposed to be strict time, though the seven-minute rule was flouted by many of the residents. Fortunately, there was Joshua to shame those who went overtime! Oliver Walker, bangaloREsident@1 Shanthi Road, presented about his past works, all of which bridged visual art installation with social, historical, and economic data. 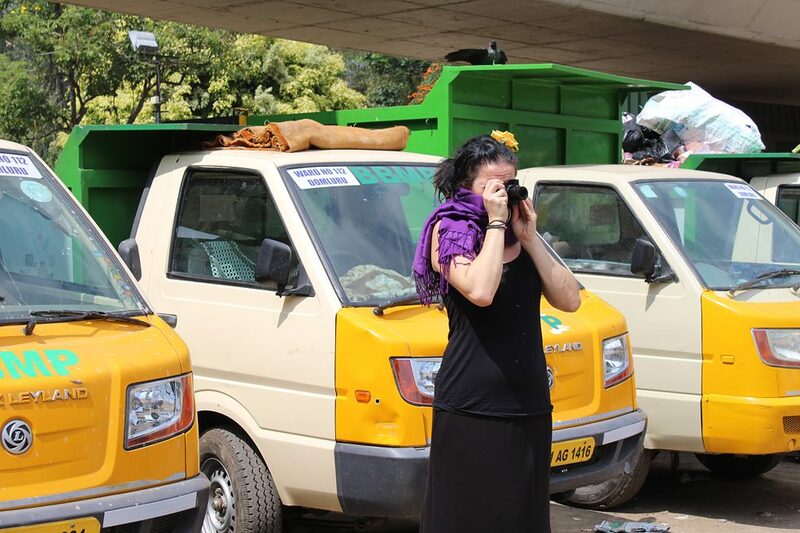 In Bangalore, he plans to extend this practice into an investigation of plastic bags – viewing them not simply as environmentally harmful objects but also ones that are easily owned by everyone and can bear unexplained sentimental value. So many of us, he says, have that one plastic bag that is special, that we will not throw away. The contradiction between the commonness of plastic bags, the emotion they can evoke, and the damage they can cause is one of Oliver’s primary concerns. 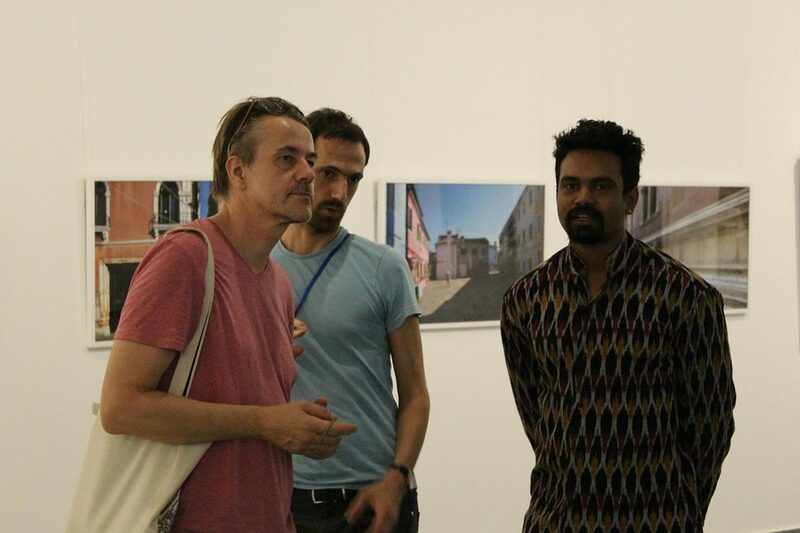 Ingo Gerken (left) & Oliver Walker (right) | Photo: Maximilian Hollerith © Goethe-Institut / Max Mueller Bhavan Ingo Gerken is bangaloREsident@1 Shanthi Road too. A conceptual artist, Ingo often creates works that are minimal in their visual form but carry a pointed comment in the history of how they came into this form. He performs simple tasks – like trimming a hedge or tossing a rock into a gallery – on seemingly ordinary materials to heighten or realign the connotation of the object on display, as well as the space within which it resides. Between the political, poetic, and humorous, Ingo plans to continue interacting with space in this way in his bangaloREsidency project, to create sculptural interventions that reimagine the normality of existing spaces in Bangalore. This is not Benjamin Brix’, bangaloREsident@Sandbox Collective, first trip to Bangalore. Earlier this year, he worked on the theatre production, Ramanaya, which was a collaboration between German and Indian artists. During his previous visit, Ben discovered the flower market in K R Market. Every morning, flowers arrive to the market from villages and towns around Bangalore. Giant piles of buds and garlands fill the market – it is a very special, colourful sight. In his residency, Ben wants to follow with his camera the journey of the flowers, from where they arrive and to where they depart. On one of Lina Gómez’, bangaloREsident@Attakkalari, many travels, this time to Brazil, Lina was struck by the virtuosity of the bodies of folk dancers. To her, their amalgamation of sound, movement, and emotion was powerful but also specific to those particular bodies and the contexts they came from. When she worked with similar movement practices with dancers in Berlin, their responses to the choreography were very different. With this idea in mind, Lina wants to explore the complexities in the encounter of different dancing bodies. Working with the students of Attakkalari, she will investigate how we can understand history and contexts as a source of movement. 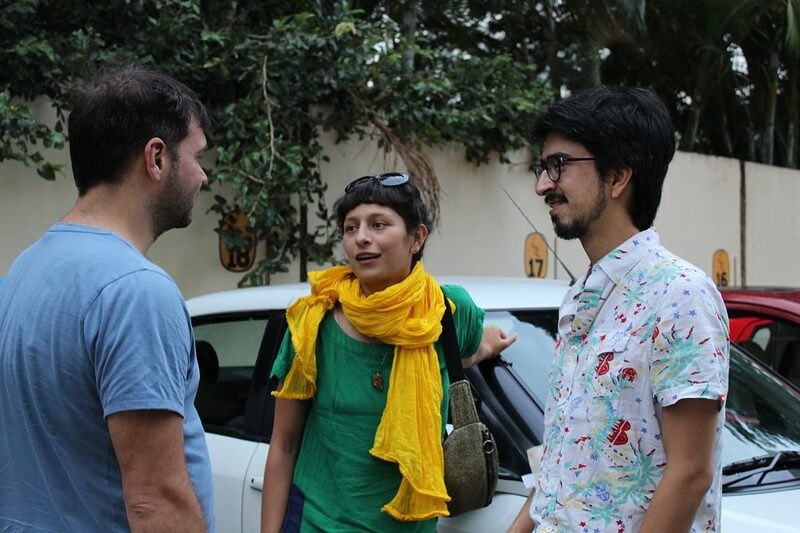 Benjamin Brix (left), Lina Gómez (center) & Carlos Andrés Rico (right)) | Photo: Marie Knop © Goethe-Institut / Max Mueller Bhavan Composer Carlos Andrés Rico, bangaloREsident@Maraa, creates radio interventions in public spaces to transform the spirit of real spaces into something closer to magical realism. Using sound as his primary medium, he subtly alters spaces so that our relationship to them changes and we see them anew. In Bangalore, Carlos plans to work with local artists to develop a series of radio interventions with sound captured from public spaces around the city. In doing so, he hopes that he can reposition how certain spaces are typically viewed, experienced, and understood. With her background in architecture, Laura Fiorio, bangaloREsident@MOD Institute, in her photography, returns repeatedly to buildings and urban landscapes. She creates visual archives of places to comment on themes such as development and gentrification. To her, the archive, as an existing document and growing resource, can be used as a means of social reflection, particularly in urban settings. At MOD Institute, Laura wants to work with people who live in Bangalore to build a relationship between contemporary photographs and traditional archives, to create a new archival repository that can address Bangaloreans’ concerns about their city. 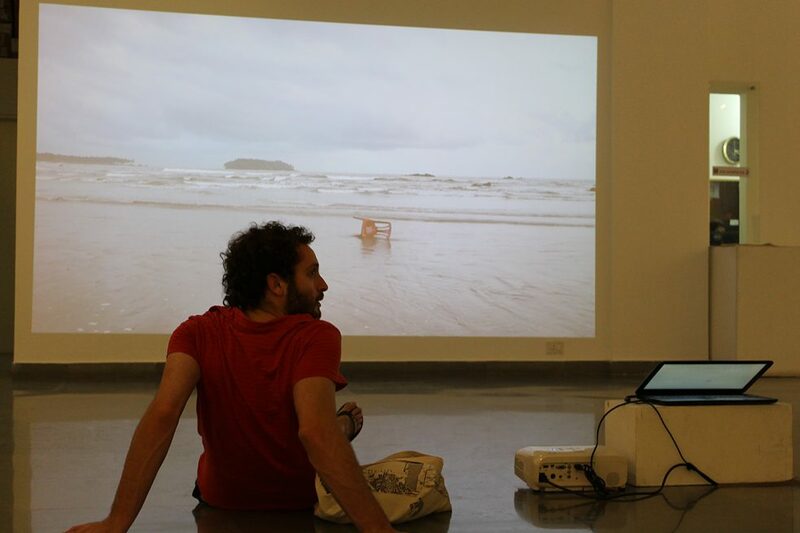 Laura Fiorio | Photo: Maximilian Hollerith © Goethe-Institut / Max Mueller Bhavan Building on the life of a character from previous works, Walter Solon, bangaloREsident@Jaaga, plans to make a short film in Bangalore – a pilot for a reality TV show. In past works, the protagonist demonstrated survival strategies for apocalyptic situations. Now, he has discovered India on his holiday after serving in Israeli intelligence and works in an IT company in Bangalore. Walter wants to use the confluence of the different kinds of people who work at Jaaga as a resource for his project. Walter Solon | Photo: Maximilian Hollerith © Goethe-Institut / Max Mueller Bhavan Verena Regensburger, bangaloREsident@Abhinaya Taranga, plans to make a stage work with the students of Abhinaya Taranga. Having worked with themes of language and communication in her previous works (particularly in collaboration with a deaf-mute performer), she is now interested in communication in different cultural contexts, between languages and bodies. 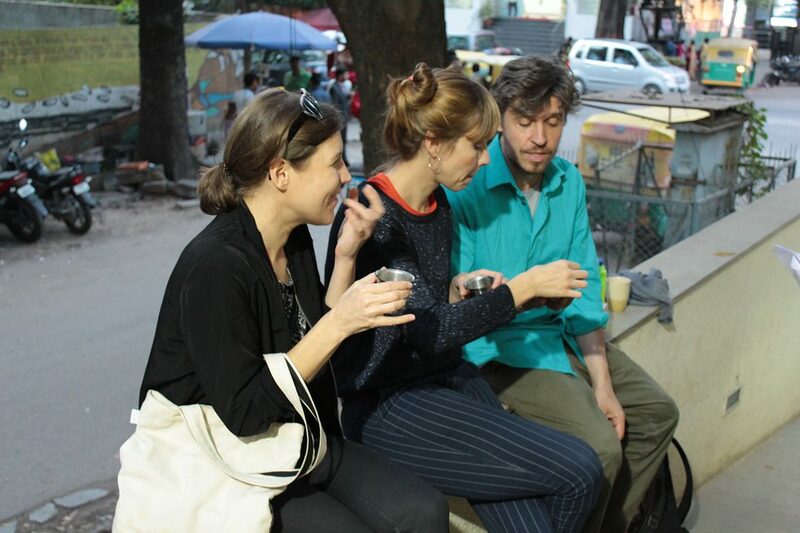 Verena Regensburger (left) & Marius Land (right) | Photo: Maximilian Hollerith © Goethe-Institut / Max Mueller Bhavan Objects are not obvious things for Marius Land, bangaloREsident@Daily Dump. They are layered entities and their meaning and purpose changes with when and how we encounter them. A broken cup for instance, might be an object meant to be discarded from a home, but in an art gallery it could stand as a sculpture. Marius describes this as the latency within objects, the possibility for them to be used and understood in multiple ways. The Indian concept of jugaad – the practice of using what one has to achieve what one needs – capitalises on this latency. 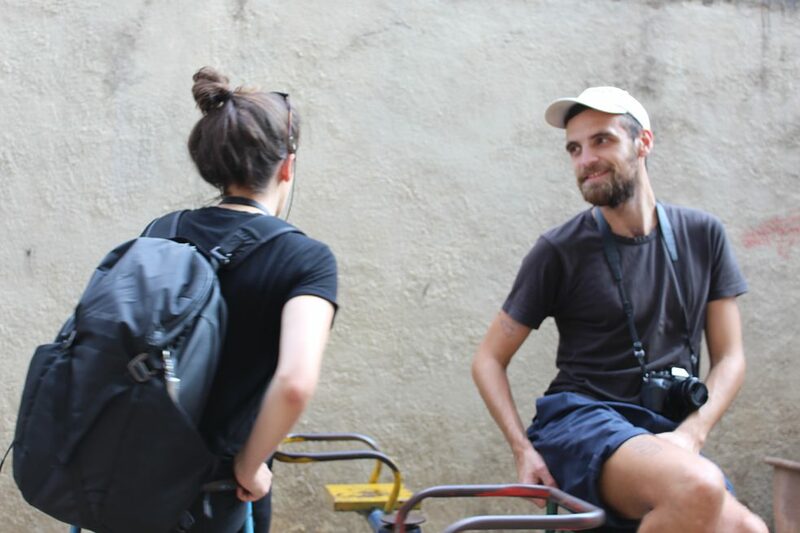 During his residency, Marius is interested in looking at what’s behind jugaad, and unpacking through objects an “innovative approach to pragmatism”.